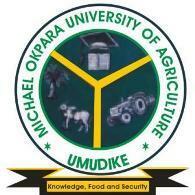 The Michael Okpara University Of Agriculture, Umudike (MOUAU) admission list containing the names of candidates offered provisional admission into the institution’s various degree programmes for the 2018/2019 academic session is out. Candidates that participated in the Michael Okpara University Of Agriculture, Umudike (MOUAU) 2018/2019 post UTME screening exercise can now check their admission status online. How to Check MOUAU Admission List . Congratulations to all the candidates that made it to MOUAU admission list for the 2018/2019 academic session.